*The transfer service must be requested at least 7 days before your arrival at the hotel by calling (+34) 902 533 532. Offer valid for bookings for the Junior Suite or the Ludic Suite. 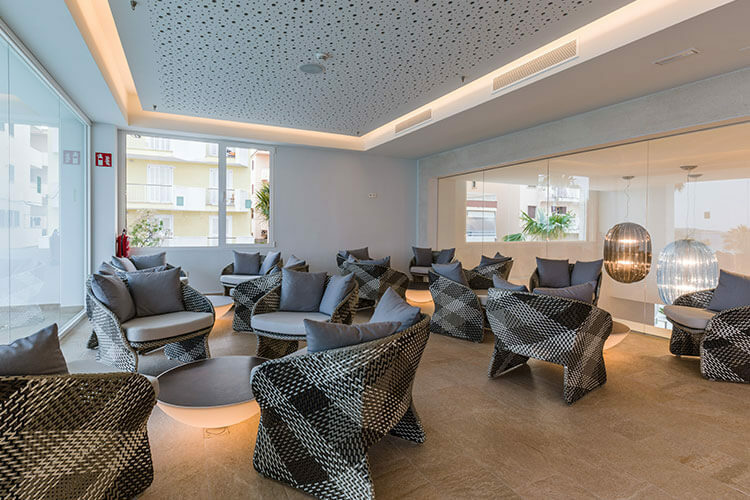 Caleia Talayot Spa Hotel is a modern 4-star adults-only (16+) hotel located at the beachfront in Cala Millor, Majorca. Renovated in 2018, this hotel with spa located facing the sea is the ideal accommodation choice for a beach holiday under the sun in the idyllic setting of Punta Amer Natural Reserve. This Mediterranean-style hotel offers 114 fully renovated rooms, most of them with terrace or balcony and wonderful views. Spacious and comfortable, they include complete equipment and a space where our guests can relax and unwind. The hotel is located in the pedestrian area of the Bay of Cala Millor, on the eastern coast of Majorca. Caleia Talayot Spa Hotel for adults only combined contemporary-style facilities with a privileged location at the beachfront, ideal for romantic trips or holidays with friends. At the hotel spa you can enjoy full treatments and massages as well as a sauna and a Jacuzzi.